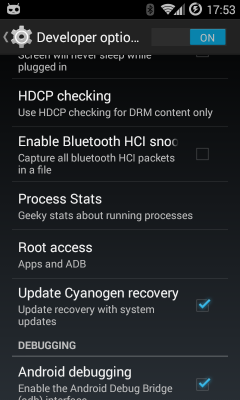 I had installed CyanogenMod on my Samsung Galaxy, and wanted a better way of accessing it. I installed SSHDroid and was reasonably pleased, but it had its quirks and limitations. Then I learned that there is an SSH daemon and it's pretty easy to set up and enable. I followed a different path, though, as almost everything I want to do needs root access. Mostly this is using scp to copy picture files out of /storage/sdcard1/DCIM/Camera/ and then deleting them through ssh. That directory is owned by user root and group sdcard_r and it's mode 770. The other thing I commonly do is compare things like the networking commands on Android to those on Linux. So, the shell account you get from the adb shell can't do what I want. Go into the settings menu on your phone, select Developer Options, and find Root access. Tap it and change it to Apps and ADB. Now you should be able to run adb shell from your Linux notebook or desktop and get a shell on your USB-connected device. Within that session, become root with su. 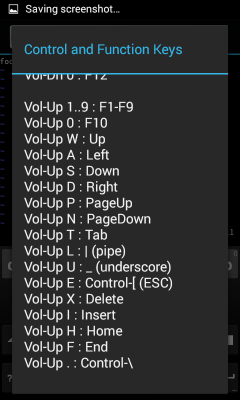 If this isn't possible, you can do the following work from an Android terminal emulator. The trickiest part is editing a pair of configuration files, but just use vim after verifying how to input a Escape character. 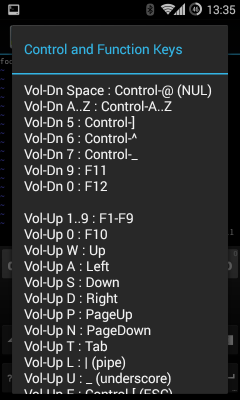 For the terminal emulator I use it's done by pressing and holding Vol-Up and then pressing E. Also try Vol-Up by itself, and the Back button at the bottom. Finally, you need an SSH key pair, see this page for details on using ssh-keygen if you haven't done this yet. The result will be key files in ~/.ssh,, public keys in id_rsa.pub and id_dsa.pub, private keys in id_rsa and id_dsa. The file authorized_keys will contain all your public keys. The standard place for SSH server configuration is the directory /system/etc/ssh/. However, the next time you flash a new /system, which might be within the next week, you would lose your settings. We will put our system configuration and host keys in /data/ssh/ instead, and we will make sure to start the SSH daemon so it expects that. You should see that directory /data/ssh exists, is owned by root, and is mode 700 or 750. It should contain a directory /data/ssh/empty/ with no contents and mode 700. These should already be there. If they seem to be missing check your typing. If you really need to, re-create them if they are missing for some reason. Create a user SSH directory and make it owned by user shell temporarily. Don't overlook the "." in the file name! /data/.ssh is for user configuration. An SSH configuration already exists on the phone, but we will make a few changes and put the modified version in /data/ssh/sshd_config so it is not overwritten when we do the next system flash. We only need to make a few changes. You will find that most of the file is comments, and much of what you are doing is uncommenting settings already in the file. Depending on the version of OpenSSH, some may have already been the default behavior anyway. There is a script on the system to start sshd, but we need to change where it looks for its configuration. Change the two instances of /system/etc/ssh/sshd_config to /data/ssh/sshd_config. Check your work. This shows the output you should see. You won't see the colored highlighting, I added it here to draw your attention to what you need to check. Run /data/local/userinit.d/99sshd and log in over SSH as root from another system. Warning: If you had been using another SSH server such as SSHDroid, your SSH client will have saved those old server public keys. The native Android SSH service will generate its own host key pairs the first time it starts. Your SSH client will not see the expected server public key, it will display a warning message and then abort the attempt to connect. You need to edit your ~/.ssh/known_hosts and remove the existing line for your Android device. When you succeed, reboot the Android device and verify that the SSH service was automatically started. Be very careful doing everything as root. You have no need to worry about someone guessing a 1024-bit (or longer) RSA key, unless you somehow generated your key pair in a flawed environment. Your primary concern is self-inflicted damage from your own root activity.